The ISO 17316:2015 Information and documentation--International standard link identifier(ISLI) is an international standard officially published by International Organization for Standardization（ISO）in May 2015. The ISLI Registration Authority (ISLI RA) has overall responsibility for the maintenance and governance of ISLI. ISLI is a member of international identifier standards in the field of ISO subcommittee ISO/TC46/SC9 (identification and description), and it is applied to identify the links between different entities. “Source” is an entity which is the origin of a link; “Target” is an entity which is the destination of a link. The figure below shows the link model of ISLI. These entities may include, but are not limited to, material objects which carry or attach information, electronic documents, media resources (digital or analog, fixed carrier form or non-fixed carrier form), data entities, parties (natural person/legal person), or other abstract items (e.g. time, places). The ISLI does not change the content, ownership, right of access, or existing identification of these entities. You can purchase the ISLI Standard through the official website of International Organization for Standardization (ISO) (http://www.iso.org/standard/59560.html) to get more relevant information about ISLI. Whereas other standard identifiers identify a certain specific content form or carrier type, ISLI identifies the links between resources. In the information technology environment, the "links" which are built can be identified by ISLI codes based on their "interconnection". 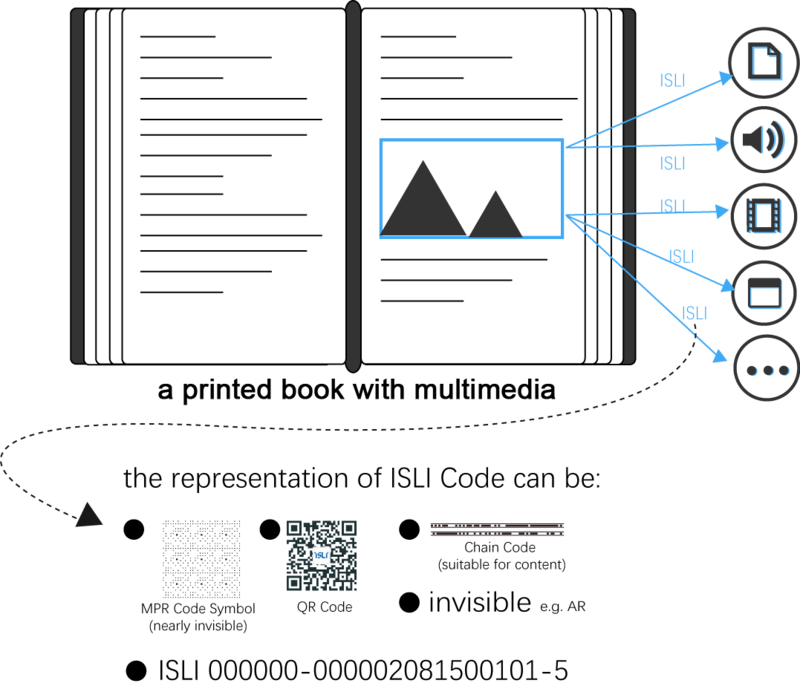 This can contribute to enhancing cooperation among identifiers in the information and documentation field, can benefit the ordered management for "interconnections", and maximize the value-in-use of information and documentation. ISLI codes can be used to establish and identify links between different types of content resources, and so, new publications can be produced based on these links, such as publications in multimedia or different themes. These can help to enrich the experiences of readers by means such as more extensive reading, more diverse reading, or by personalized reading. The design of ISLI is well-suited to the perspective of content producers, enabling producers of publications to reuse existing resources to generate new products easily and conveniently. ISLI can help content producers manage and control their products in the digital era; the producers can control the sales and other transactions for relevant products using ISLI codes, and hence realize an innovative business model. ISLI can provide an important platform for developments in the information content and information technology industries, as well as the fusion between them. In terms of the link applications for books, there is an existing ISLI Application Technology Service Provider (SP) who has established a set of ISLI All Media Integrated Publishing Solutions to demonstrate the application of ISLI codes throughout different related steps in the product life-cycle such as content producing, internet distribution and transaction, and terminal e-reading. This solution offers systems and tools for publishing parties to help them handle all the stages from content resource management and application to disposition. By 31st December 2017, more than 400 book publishers had registered in the ISLI registration system operated by ISLI RA. There are more than 4,000 books which have used ISLI codes to build links and to realize fusion publishing. An MPR publication is defined as a new kind of publication in China. It uses the ISLI to synchronously render the printed content and the linked multimedia content (audio,video). 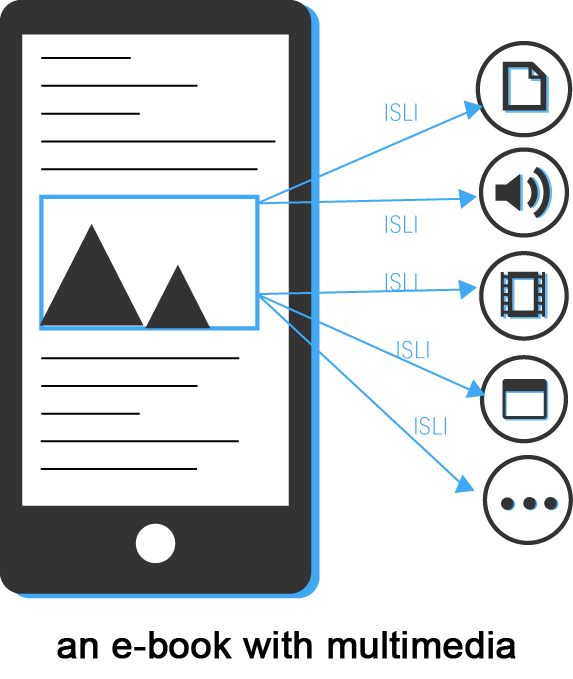 An ISLI E-book is a publication that has related content or content storage space (for readers or content producers to use in the future) that is identified by ISLI codes and can be presented on all kinds of network terminal electronic reading devices through the internet. Compared to most multimedia E-books, the ISLI E-book can continuously enrich the linked target information by augmenting it with additional content from trusted third-parties who have valid rights permissions to make such contributions, thus creating a new publishing ecosystem with multilateral co-ordination and great vitality. ISLI codes can be applied to link a book with related information about itself or from other books or indeed other sources. ISLI can provide a means to promote content for publishers and make books a discovery tool from which to find internet-based products. 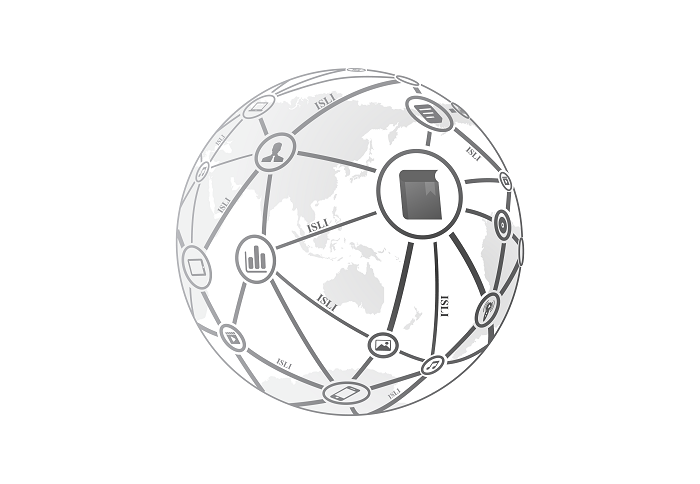 As a member of the standard identifier family, the foremost function of ISLI is to establish and identify links. Using ISLI codes to establish links between entities (either sources or targets), will not change the original attribute of the entities. Books identified by ISBN are important objects for ISLI application. Technological developments and the changes in readers’ behaviours are encouraging innovation in the forms that books will take in the future. According to statistics, books linked with multimedia contents have become a new growth point for the publishing industry. ISLI provides convenient and effective ways for producing and managing this kind of book. ISLI application for books will not change the original identification system of ISBN yet it can build up links between ISBN identified books and other content resources identified by other identifiers (such as music identified by ISRC). Therefore, content resources identified by different identifiers can be vitalized and different identifiers can contribute to each other. Based on the application needs between ISBN and ISLI, the ISLI international Registration Authority and ISLI Registration Agency of China made an experiment in China, in cooperation with ISBN China center, so that publishers who applied for an ISBN for a book could also receive an ISLI code set simultaneously to help them to build links for the book. Now ISLI RA is coordinating the ISLI system with the China ISBN system. Through this exploration, we hope to establish a model for ISLI cooperating with other standard identifiers and to promote the fusion among them in the premise of facilitating the users and not changing the existing identifier systems. Thus, this exploration can increase the effectiveness of identifiers of ISO TC46/SC9, meet the needs of users to link the resources identified by different existing identifiers, and facilitate interconnection and interoperation between different registration authorities in the digital environment. ISLI Registration Authority (ISLI RA) is the administrative organization set up to manage the ISO 17316 standard in line with ISO Directives and to take charge of the assignment and maintenance of ISLI codes. International Information Content Industry Association, whose headquarters is in Hong Kong, serves as the International Registration Authority of ISLI, taking charge of ISLI registration management and ISLI industry promotion globally. Users can receive ISLI codes and service resolution free through the ISLI registration system (www.isli.org) provided by ICIA or get access to more relevant information about ISLI. ICIA is an international non-profit organization with members in the book, newspaper, magazine, audio, video, film, and TV program publishing/production/management industries, and the related information technology industry, as well as other relevant entities and organizations in various countries and regions around the world. ICIA is dedicated to constantly explore new ways and methods to protect and maintain the rights of information content producers, as well as to increase productivity by applying new technologies under the new technical environment. ICIA will continue to explore new models for the information content and technology industries, to co-develop and cooperate for a win-win situation, to help the international information content industry to grow steadily and optimally. If you are an information and content related or an information technology related organization, we at ICIA sincerely invite you to join us, together we can work towards the infinite bright future for the information and content industry.